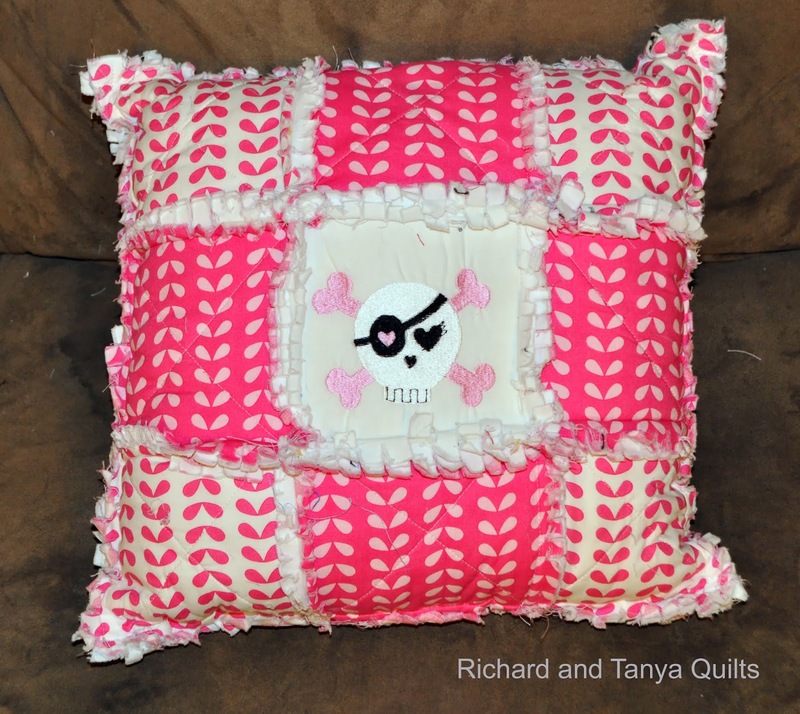 Thank you for visiting Richard and Tanya Quilts. We are excited to show off some of last weeks finishes. Please visit some of these great sites and link up your finishes this week. 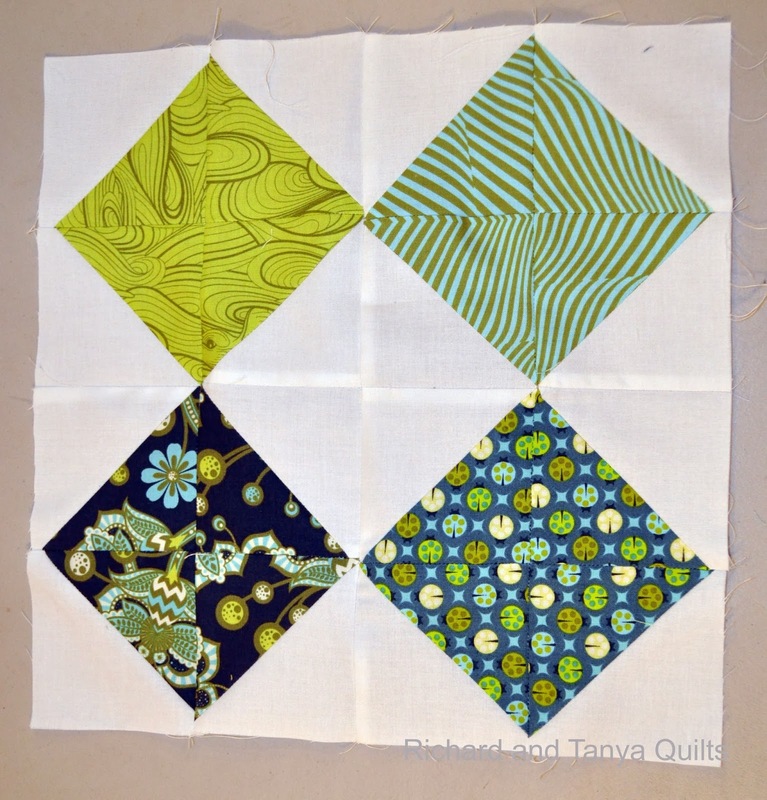 These are some of the great quilts linked up last week. Link up your finishes and don't forget to visit some of those that linked up. Monthly Giveaway of $15 Gift Card from our sponsor Fat Quarter Shop. Please thank them and visit them for your quilting needs here are some of the places you can find them. Link up Rules are simple. 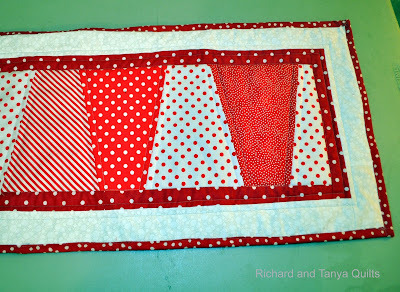 Link up something you have finished, Worked on, blogged about, slaved over or other wise accomplished over the last week or so. No item not allowed. 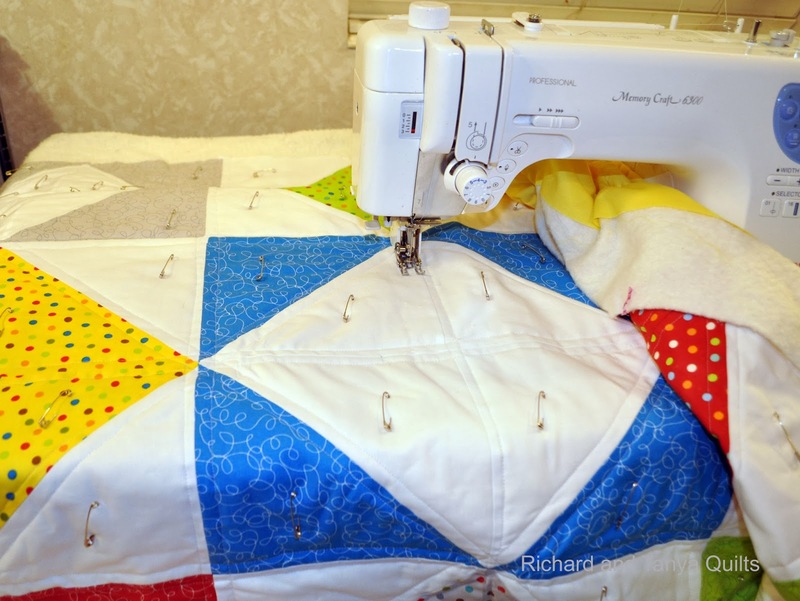 Link up some of yours, visit some of the others and enjoy your quilting day. 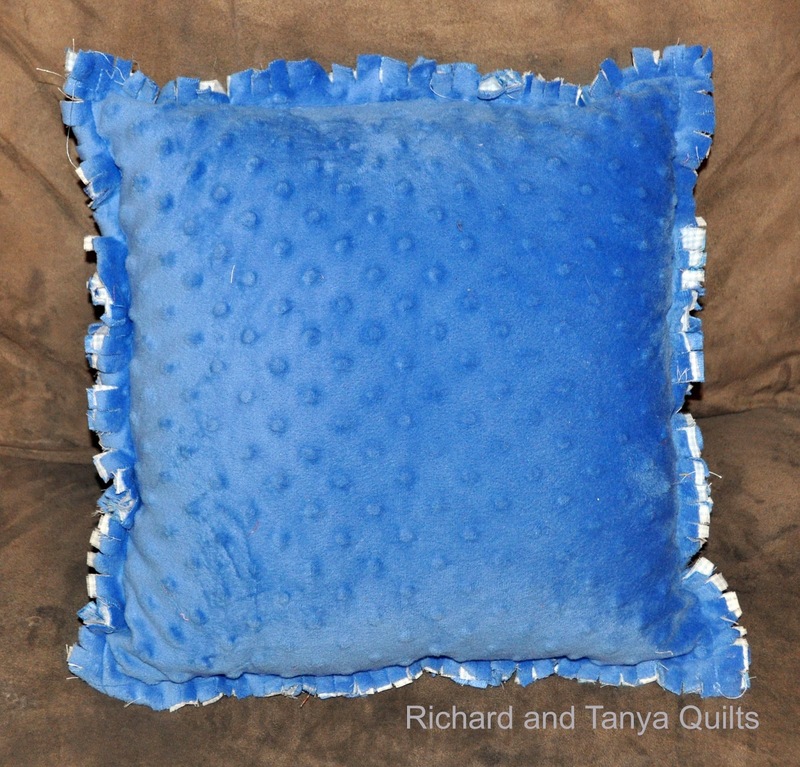 This is the last of the 7 pillows that Tanya made the kids (Our kids, nieces, nephews) for Christmas Last year. 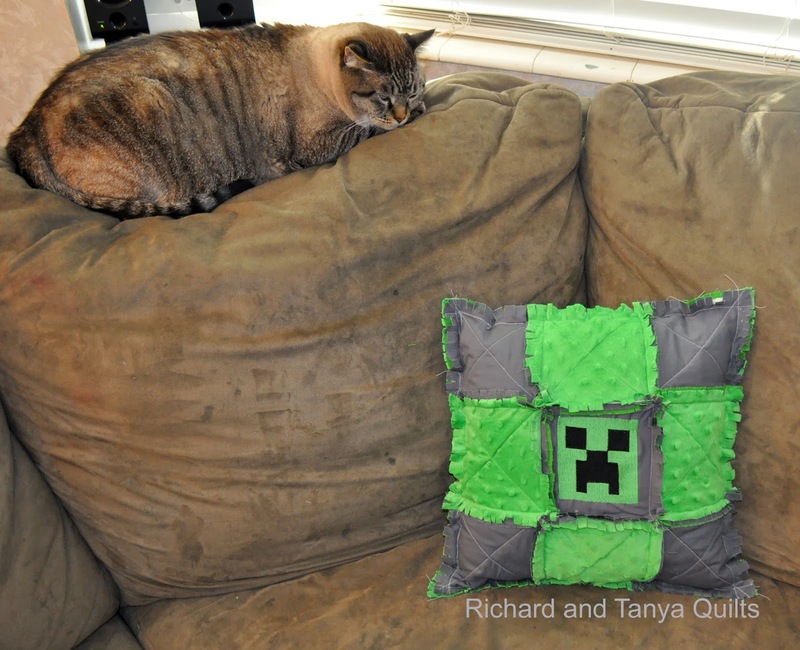 Each and every pillow turned out so amazing. Tanya a year ago got a embroidery machine and we have done one or 2 little projects. 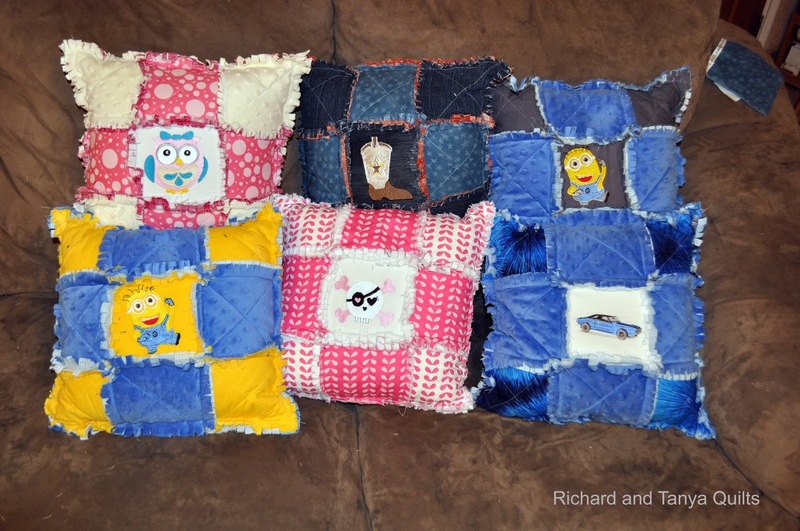 Well she got this idea for rag quilt pillows and wanted to spruce them up some and so she went hunting for embroidery designs that the kids might love. This pillow I think was one of the more fantastic ones, as it is so not Tanya. She is not into skeletons at all but the niece that this went too so is into it. I had forgot to get a full picture of all 7 together before we gave them away so above is 6 of them and below the 7th. My favorite one of them all is the yellow and blue minion on on bottom left above. I think Tanya should make many more. My second favorite I still get to enjoy its the owl that went to our little Julia. 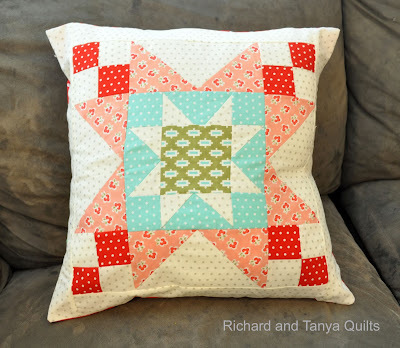 Life is busy and here at Richard and Tanya Quilts we are behind on what we are doing. 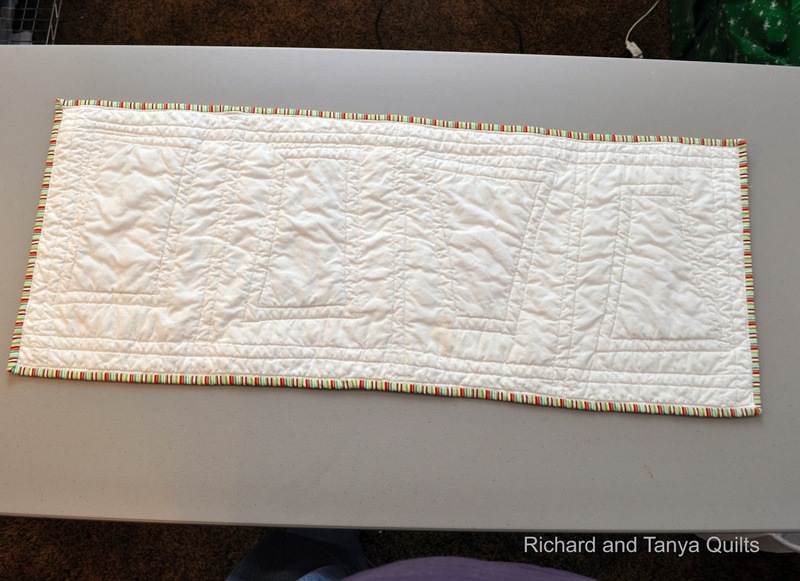 This quilt above was quilted on Jan 9 2014 and almost 3 weeks later it is still sitting in a pile ready to wash and still waiting for its shot at fame here on our blog. Part of the reason that I am so behind on posting what I am working on is that I have a bad knee. I don't believe that I have mentioned this and its about time to do such. About 2 and a half months ago I was taking 2 plates of food from our kitchen to my computer room and while exiting the kitchen I stepped over our baby gate that we had up to keep little Julia out of the kitchen. Sadly to say I caught the toe of my shoe on the gate and fell directly on my knee (this is Richard speaking by the way). I though at first that I had just bruised my ego and I sat there on the floor and had a good cry. I took the next day off from work and just took it easy. Well 2 months later and the knee has been killing me. Last week I went to a specialist and I am told that I tore a little of this and a little of that and that I will need to have surgery to fix it. This has been stressing me out and of course stressing Tanya out. Well the day of the surgery is now only a couple days off. I will be having Arthroscopic Knee Surgery Thursday of this week. I am nervous and as such a little antsy and have not been doing as much sewing as I should be (Just ask my task master Tanya I am getting behind). Not all things in our life is down, we have many things going up. 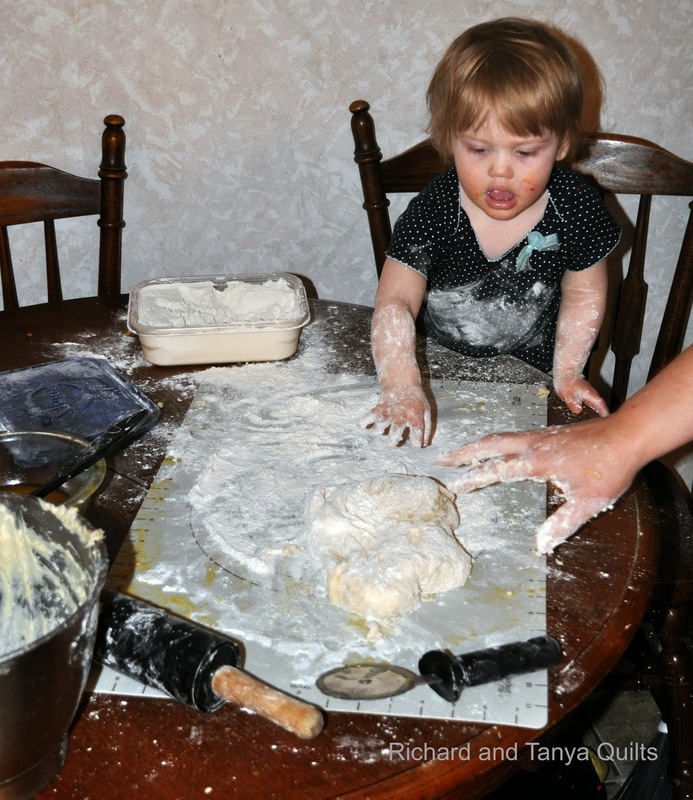 For example our little Julia is growing and she thinks that she gets to help mom make rolls. Here she is getting into the food. She really liked the idea of helping and you can see she really got into her work. It was interesting tonight going though the camera looking for pictures for this post. I found all kinds of fun pictures. 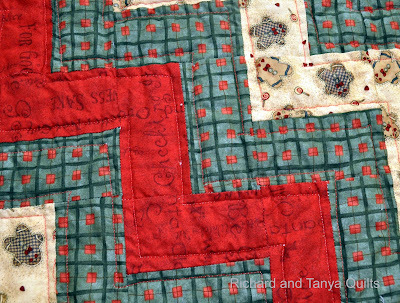 This is another quilt I quilted some time over the last 3 weeks that also has yet to be blogged about (I could be wrong about this as Tanya, I think posted this one already on our Etsy Store) and may have made a post about it though I don't think it has gone live yet. 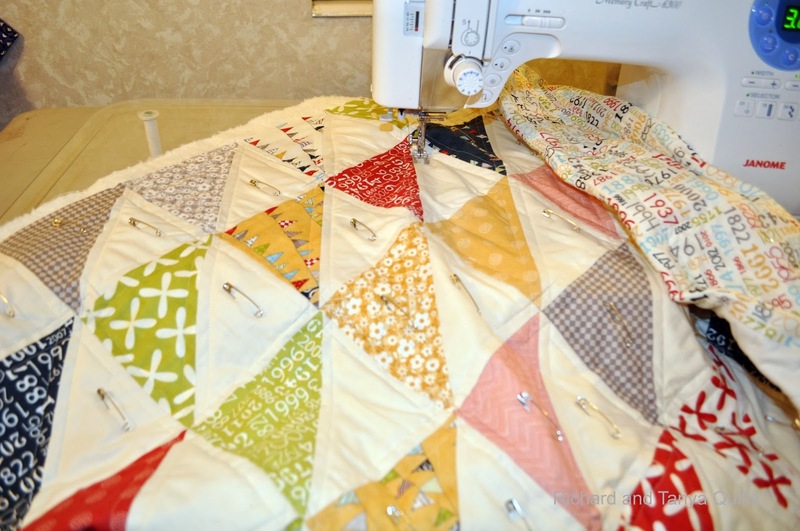 These HST quilts I stared last year shortly before wounding myself I planned on making 3 new patterns and wanted to make 3 quilts of each of the 3 patterns for pictures. This quilt is one of those made out of Reunion one of my most favorite lines. Today while at work I decided it was about time to finally comment on my blog about the real distraction in my life. I at the time could only think of negative things to talk about. I hate to have posts that are bad news. And my knee is bad news. 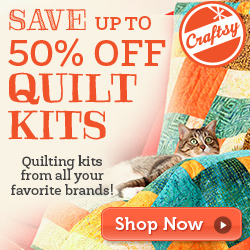 When I got home from work though Craftsy made up my mind for me on what could be my good news for today. About 5:30 pm tonight I had a couple emails from sells of patterns on Craftsy. Then a few minutes later I had a couple more. Then a few minutes latter a couple more. 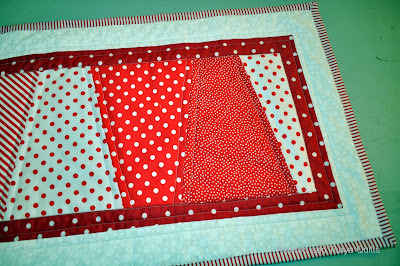 It was really a weird thing our Windows Quilt pattern (which we really thing is extremely cute has never really sold). Within a 10 minute time span we sold 8 of them. Wow was I excited. I logged into Craftsy to figure out what was going on and on there Top 20 Patterns list as the above image shows I was there #1 best seller. I think this is the first time I have ever been #1. A couple weeks ago I grabbed this screen shot of my Easy Table Runners patter at #4 which generated 5-6 sells while on the Best Seller list (it quickly went away by the way). 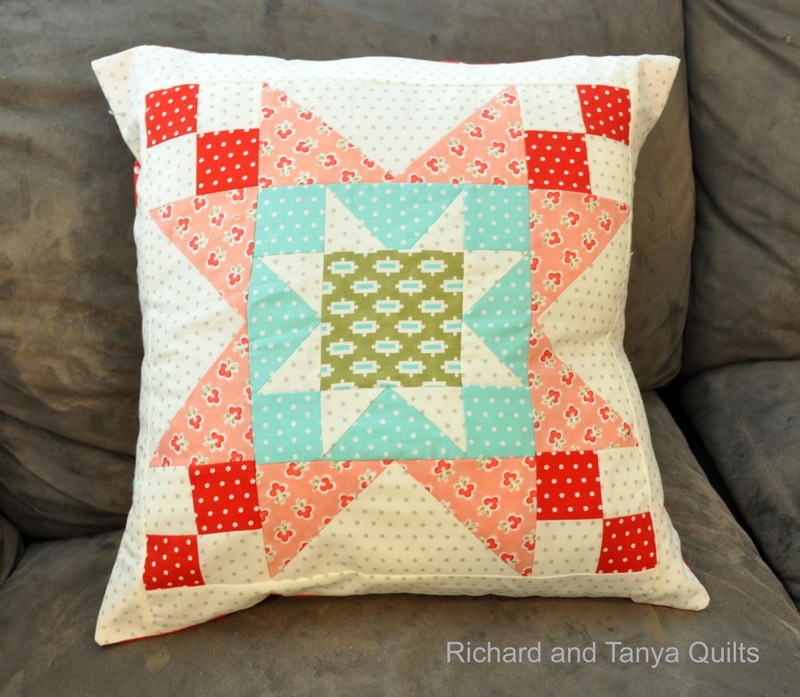 While the Windows Quilt pattern is now selling and blowing me away. Talk about making my entire day today I have sold over 100 copies of this pattern in the last 6 hours. 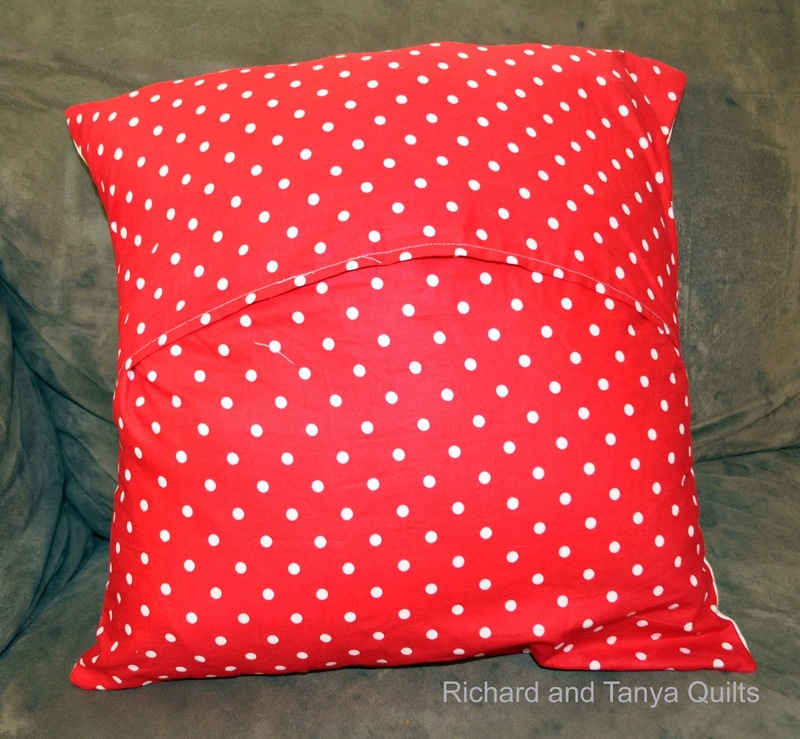 Tanya and I starting this year made a commitment to each other that we are going to be in control and not spend even 1 penny this year on fabric or sewing sewing supplies more then what we make this year on quilts or and patterns (Quilting Income). 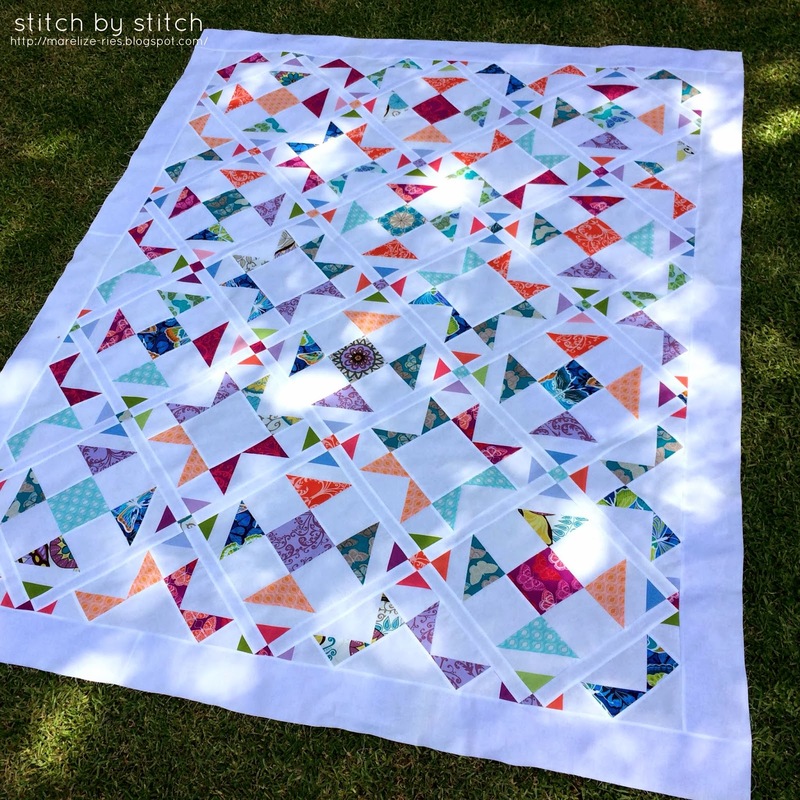 So I am sitting here at 11pm writing this post and my poor phone is still making noise over each email about a pattern sale. Poking around on Craftsy I found yet another neat little item. On the side bar of many pages is a neat "Featured Pattern Designer" and I have always wondered what you had to do to get your name listed there (Well I still am wondering and its my name there). Wow to my shock and surprise I see my picture and my quilt and my story in big bold print. 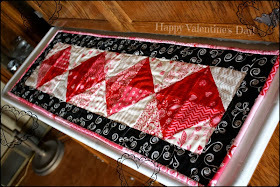 With out taking any credit for the great pattern (since Tanya wrote it) I do have to admit it is my favorite quilt pattern (I created the idea of this quilt) as it has its roots in one of the first and worst quilt disasters that I ever did. 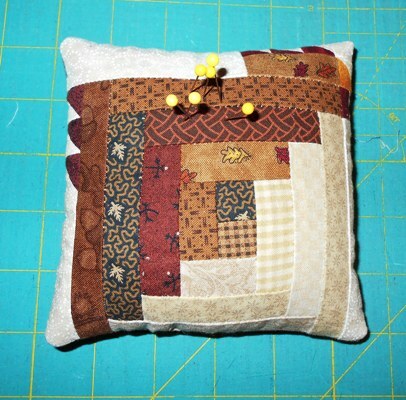 This pattern is based on a quilt named Train Wrek. 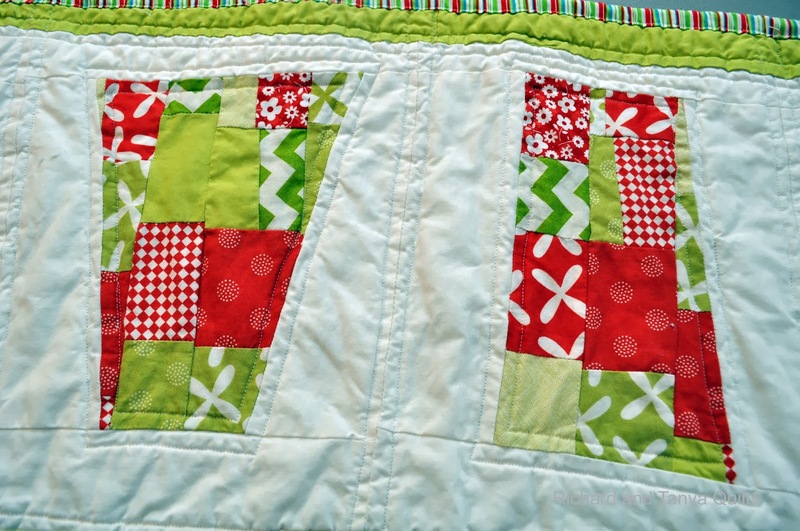 This quilt was quilted for Julia before she was born way back in January of 2012 over 2 years ago. Reading that post is entertaining. For one my style of writing and making posts has greatly changed, as well as the fabric I use to make my quilts. 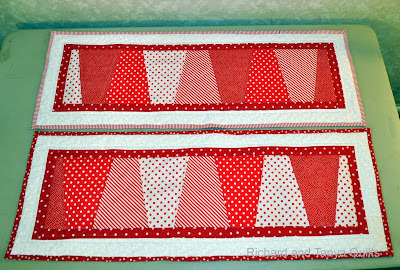 Train Wrek for example was made out of a Fat Quarter bundle that I bought at Walmart of all places (I don't generally look there for fabric any more). Its funny I am reading the post and I did not even know that a fat quarter was called such. Any way for those that are the praying type out there please keep me and my knee (oh and our family) in your prayers this week as I am still a little freaked out about this surgery. But good thing is after it is done, I can afford to go buy a new bundle of material. Wonder what other lines out there like Reunion will spark my interest. 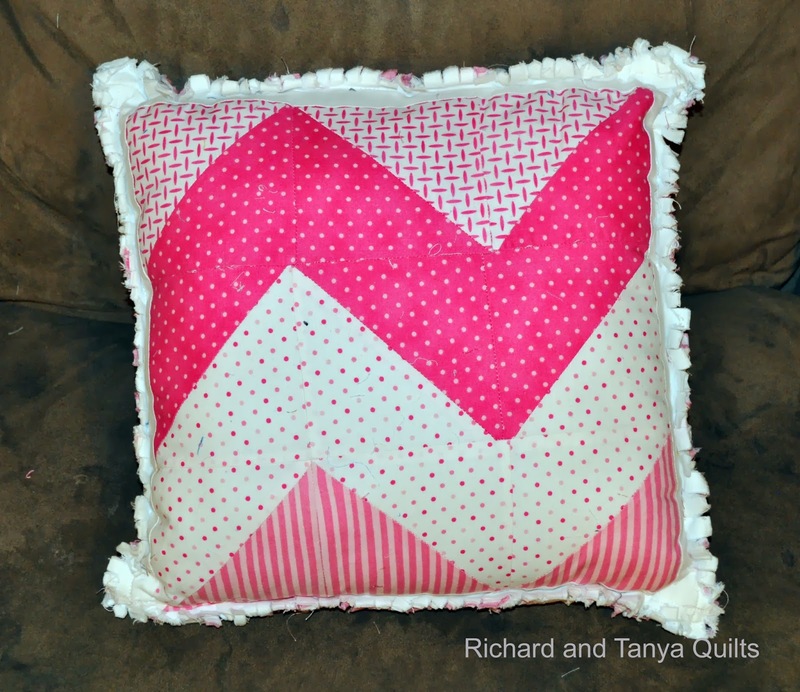 This is a pillow that we made for our daughter Rebecca for Christmas last year. 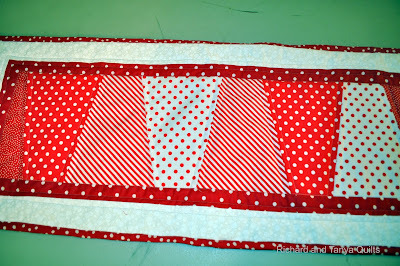 For the front it used a block that I had from a block of the month I had last year from Fat Quarter Shop. It turned out really cute. We did not know how to do a zipper, so we did a envelope (overlap). 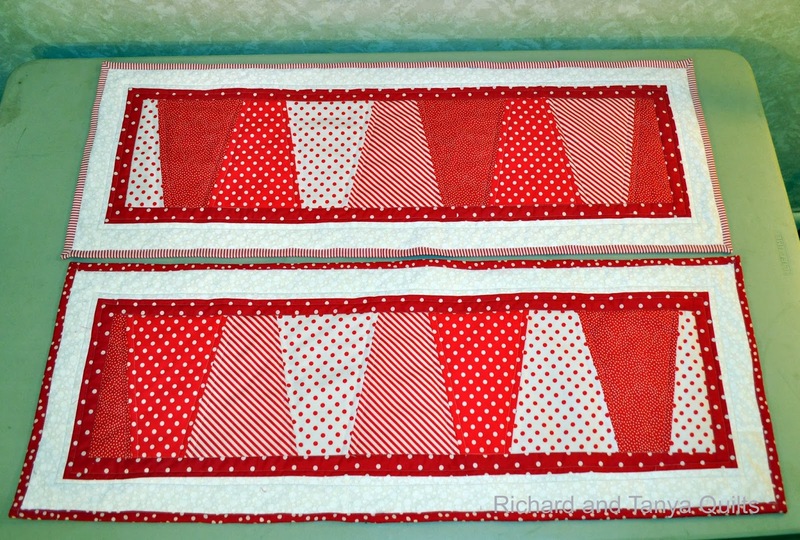 This is the 2nd of 2 identical Table Runners. They were given to my sister in law and mother in law. They were made using my Dresden ruler using mostly scrap material. 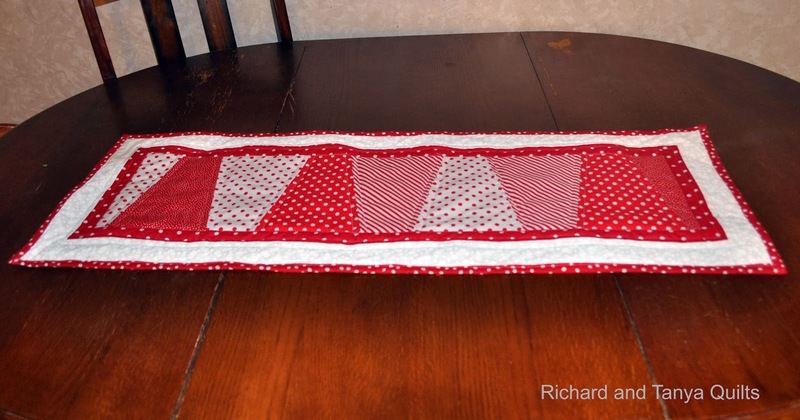 The border on this table runner was cute dots and on the last we had stripes. These were fun and easy to make and I think I plan to make many more as they make quick and wonderful gifts for friends. 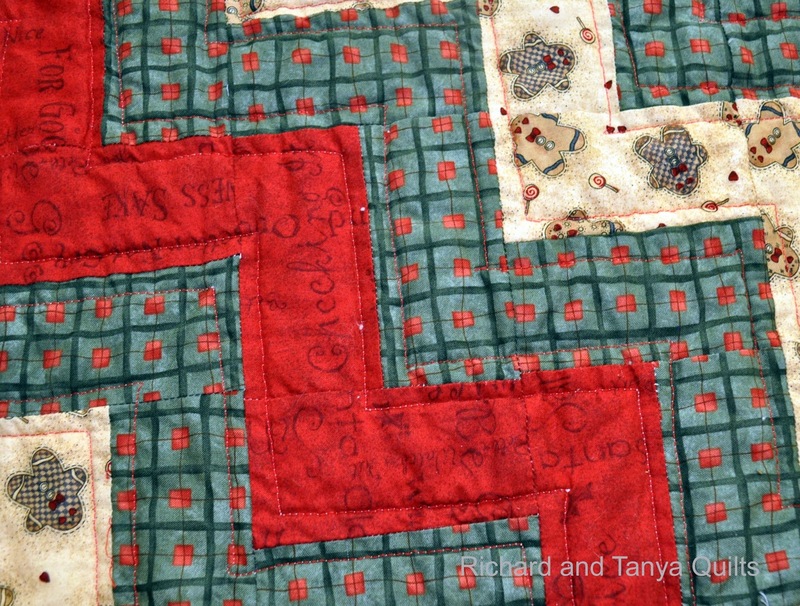 Tanya pieced the top, but I could not talk her into quilting. 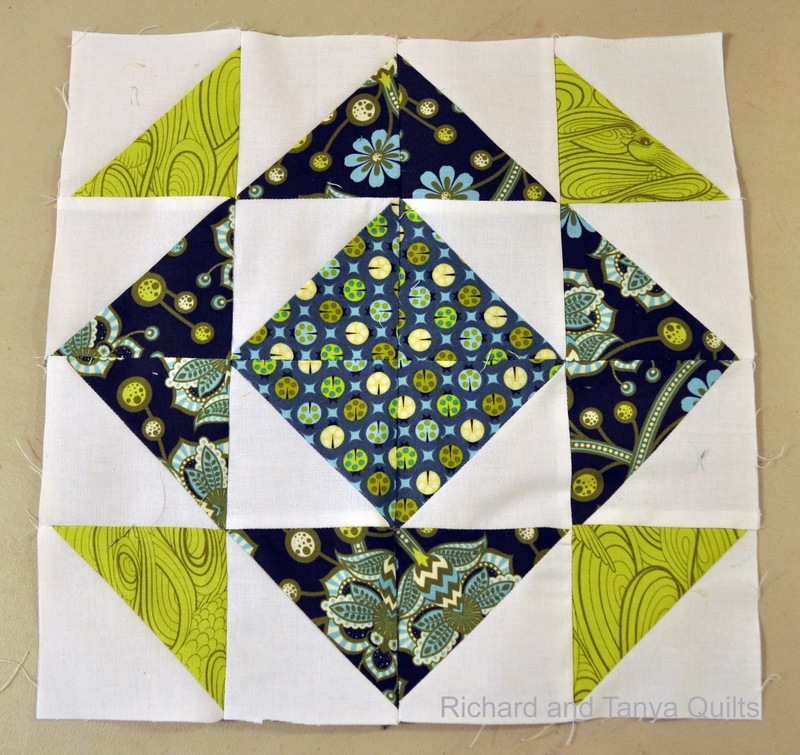 I toyed with how to quilt this as I had at that time not started on my sons quilt. 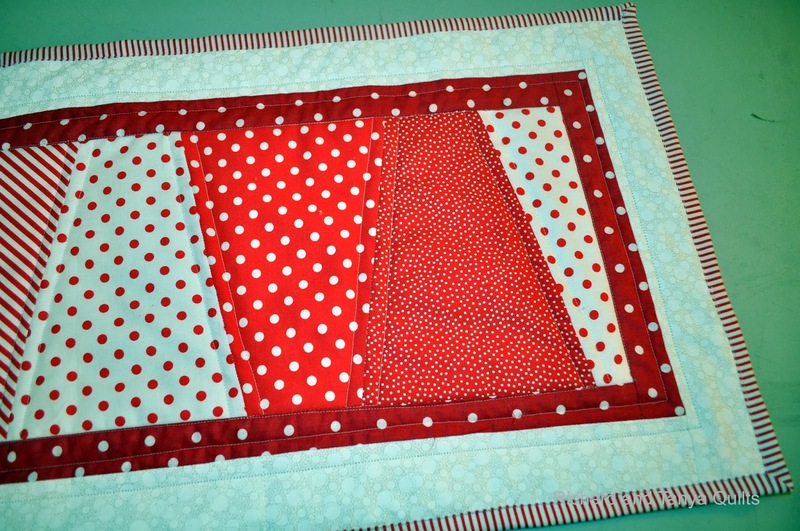 Eventually I ended up echo quilting inside and out of the crazy blocks. Finding that not enough I echo quilted around each finished block and then the out side of table runner. 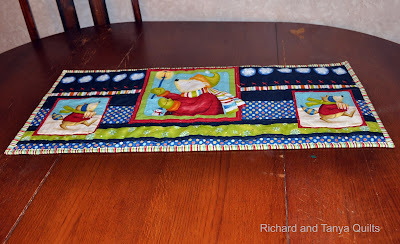 I really loved this table runner and it was fun to give it away as part of our family's Secret Santa that we do each year for families in our neighborhood. I would like to start LAFF today and thank every one that linked up last week. I was very happy to end up with 100 linked up items on LAFF #100. Now to announce the winners for our giveaway last Friday and the winner for the month of December. Random.org is my friend and helped me pick my winners. 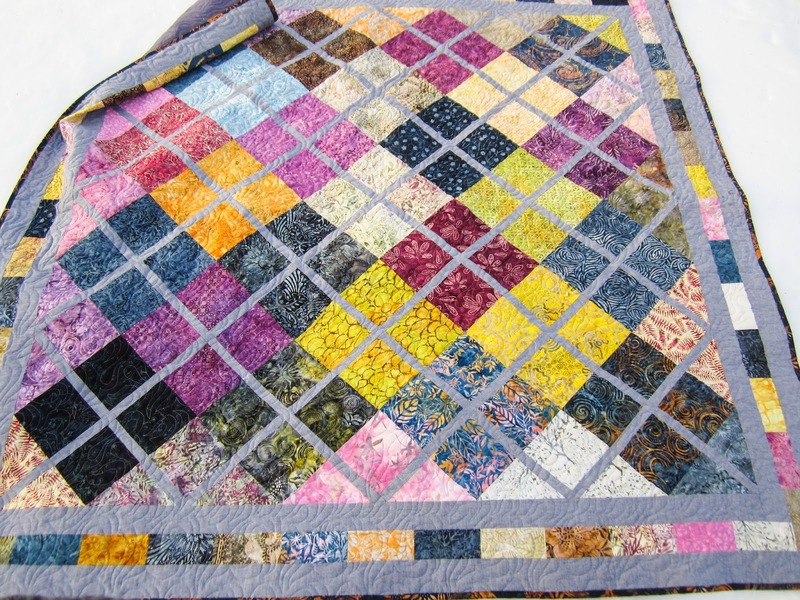 Though we had 100 quilts linked up the first quilt was mine and while it would be neat to win my own giveaway, it just did not seem fair so I excluded quilt one and the winner was Quilt 41. 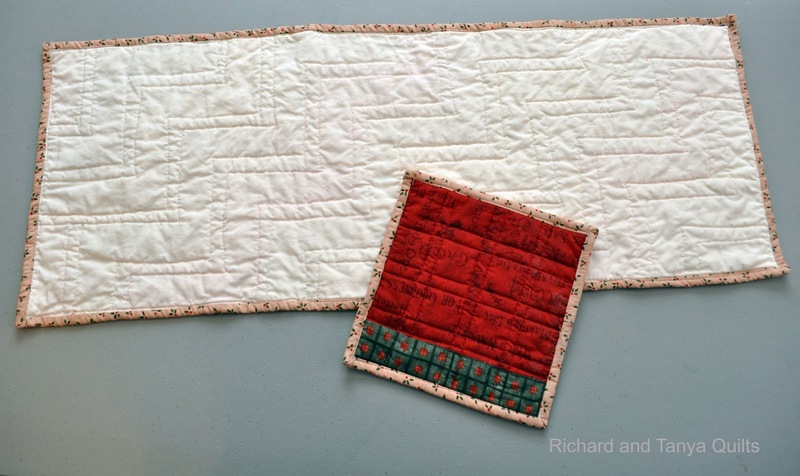 The Quilting Mill. I was really intrigued when I saw who won this, as I met him tonight at my quilt guild meeting. 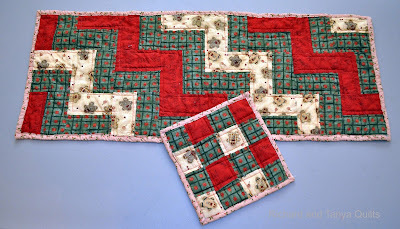 The Quilting Mill is a blog by Barbie Mills, a member of my guild and she has talked many times about her husband who has designed a few quilts in the past. This is one he finished for last Christmas. 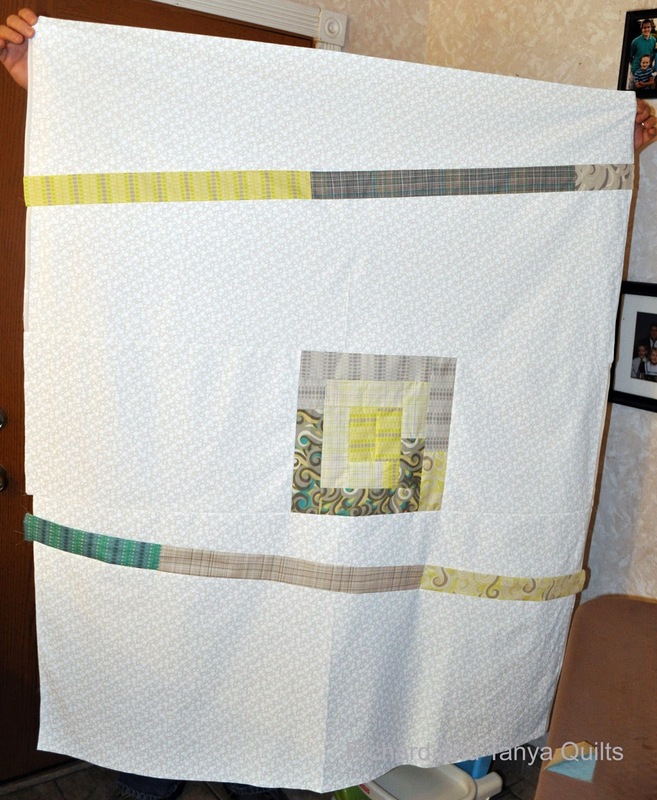 For those interested he showed off another quilt at our quilt guild tonight that he did for a challenge, you can find a picture of him and his quilt here. Congrats to the two winners and thank you for linking up. 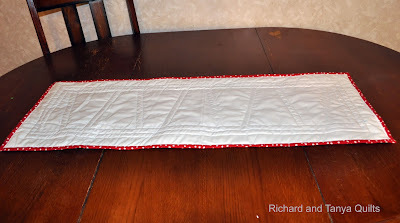 I made two table runners that went to my mother in law and my sister in law, this is one of the 2. I will have another post that shows the other one. 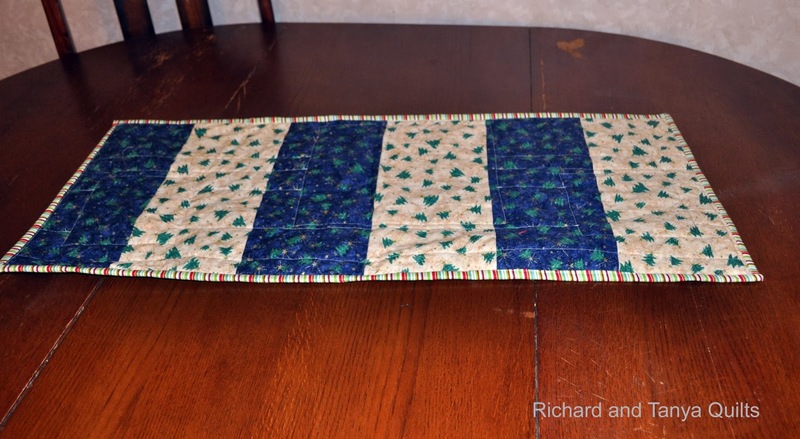 This table runner is similar to the one that I made for our Secret Santa recipient. 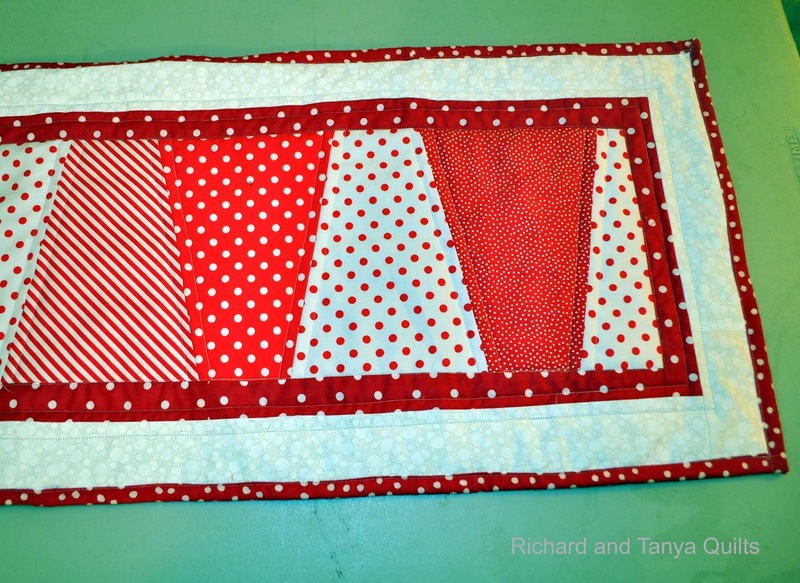 For quilting, I did a simple echo along each sewn part. The blades I believe were 8 inches long and the inner border 1 inch and outer border 2 inches. 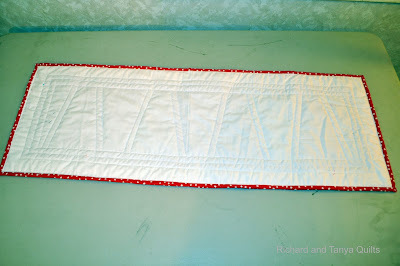 Originally the plan was white inner border and red outer border, but we were short on the red material and trying to use fabric from stash..
Another Cute Pillow made for Last Christmas gifts to the nieces and nephews. 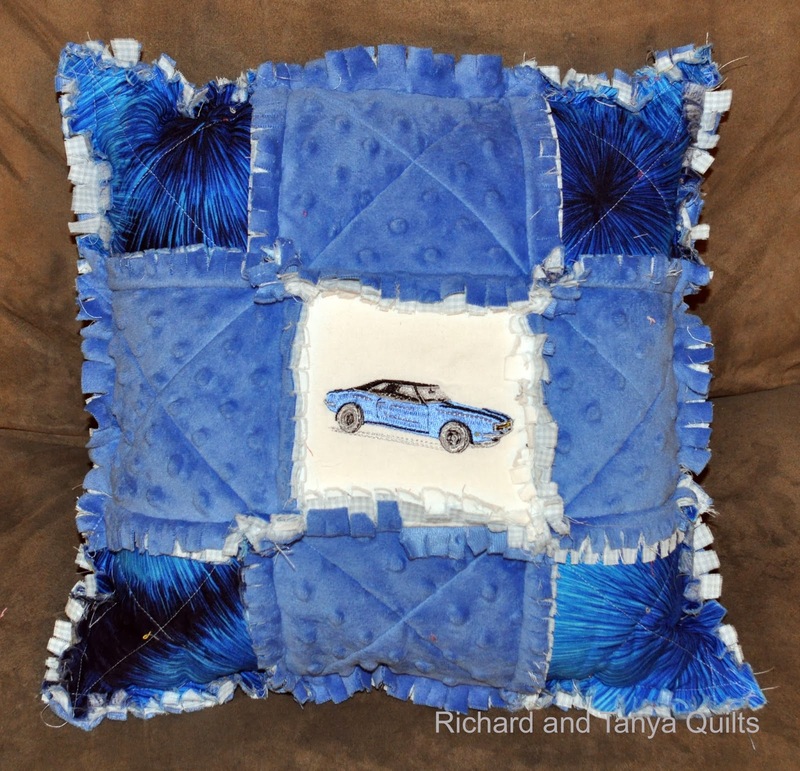 This is a fun Muscle Car Tanya found a embroidery pattern for. It was original designed for red but it turned out fantastic in blue. One cute thing that I realized as I was typing this up is the blue on the corners was a fabric Jared (our son) picked out for mom for Christmas. He gave her 15 or so fat quarters for Christmas that I let him pick out. It was so funny how much they clashed with each other from those wild prints to poka dots. 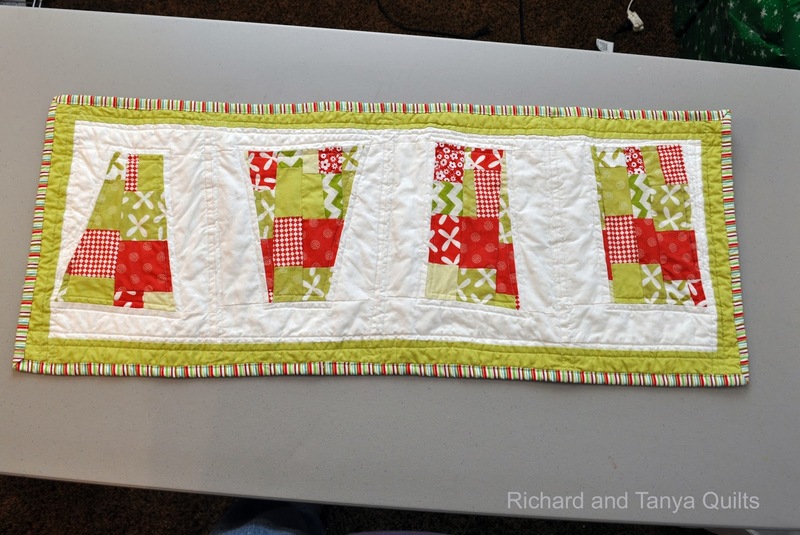 This cute holiday table runner was made by Tanya, meaning that she pieced it and then quilted it. She has plenty of times talked about her binding fairy that she has. Well for this table runner and hot pad she was happy to have the Binding Fairy do all the binding. It is very interesting. 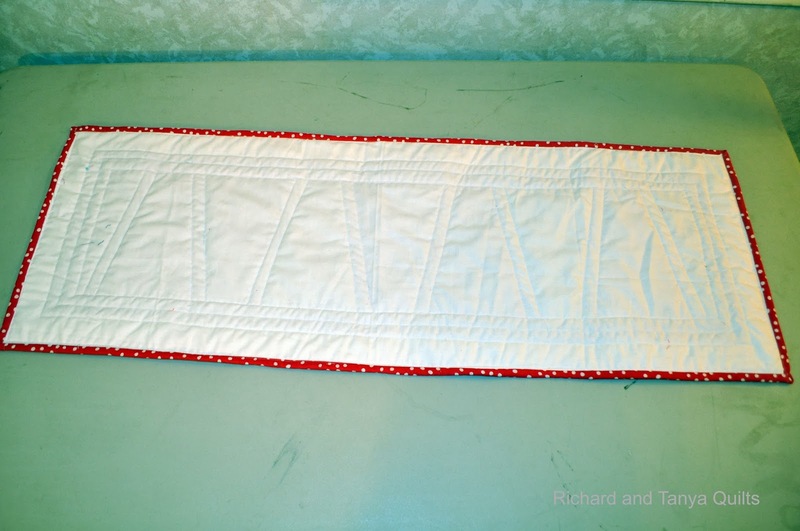 Just like the Tooth Fairy, all you have to do is put it under your pillow (OK, my sewing table) and the next morning it is done. 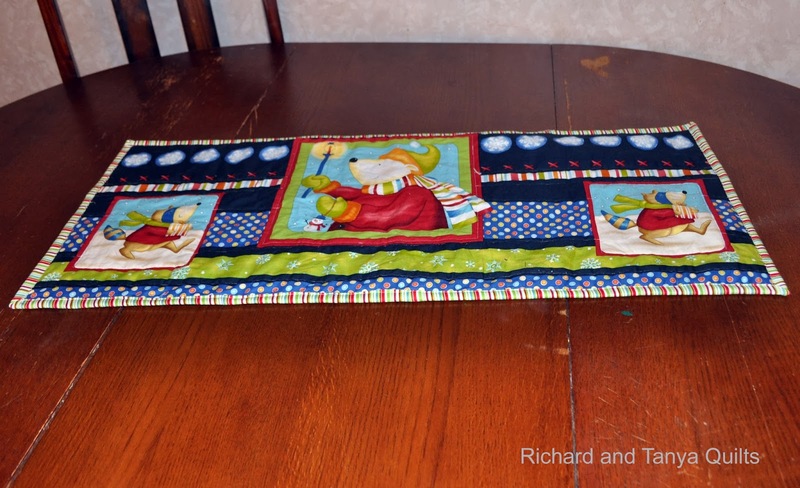 This cute table runner was made for one of our Secret Santa Family's this past Christmas. It was a fun gift for us to give on our final day. Our Secret Santa family's we give 12 gifts for the 12 days leading up to Christmas. We are sneaky and stealthy (or try to be) on the first 11 days. But on the 12th day our family delivers the last gift and lets the family know how much our family loves them. Each year we pick out 3 family's and this is not a just 12 day thing. The day after Christmas we start looking for gifts. We hit all those after Christmas sales and get bargain items. My kids have more fun doing this then opening their own Christmas each year. 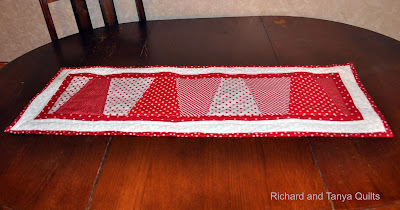 This is a simple table runner we made out of a panel that we used for a gift for one of Tanya's Sisters. 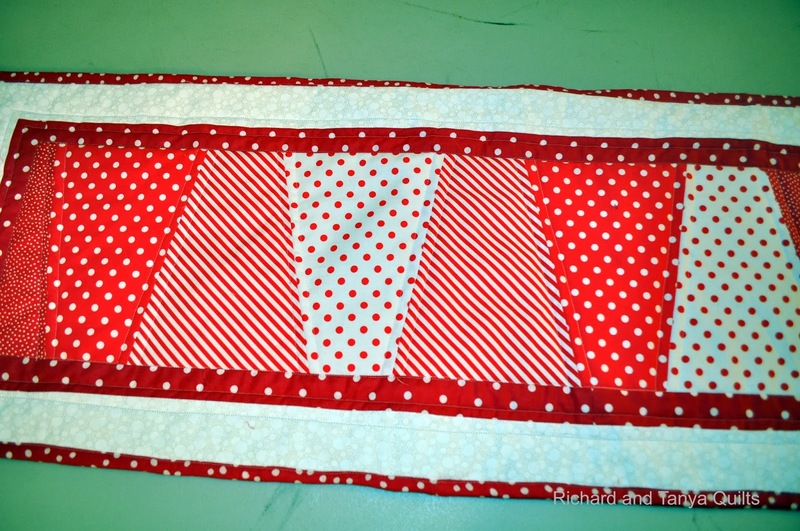 I just quilted around the box and down the rows that are on it. 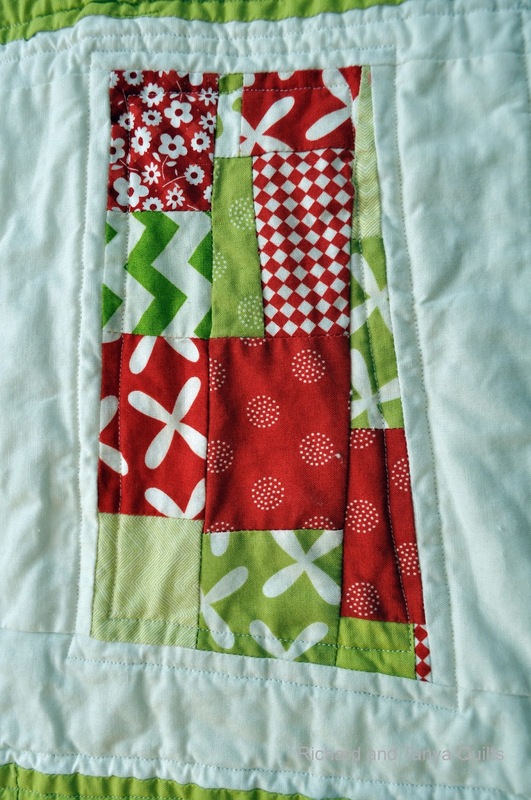 This I have a hard time claiming as a quilt because I don't think of any thing other then pieced items as a quilt. But here it is in all of its glory. Link A Finish Friday #100 and Giveaway!! !